The weather has been tremendous. Bright, warm sunshine. Blue skies. The countryside a riot of vivid colours. Good weather makes all the difference when you are on the campaign trail. It puts everyone in great form. Canvassers and canvassed alike. Thursday, May 5th, is Bobby Sands 30th anniversary and polling day. The co-incidence of the Assembly poll, the local government election, the AV referendum, and Bobby’s anniversary is not lost on republican activists. The Fermanagh South Tyrone by-election in April 1981, when Bobby famously won that seat, has been acknowledged as one of those pivotal moments in recent Irish history. In the last few days this blog has been in north Antrim, and north and West Belfast campaigning with local candidates. And on Monday I was in Belcoo, and Derrylin, and other parts of Fermanagh South Tyrone. As we drove through the towns and villages of that famous constituency I was constantly reminded of the election campaign of 81. Apart from filling election envelopes as a teenager in 1964, the Bobby Sands election was my first real election campaign. And like many others I was learning as I went along. But we were all buoyed up by the spirit of defiance and the heroism of the hunger strikers. That was a remarkable time. And it set the scene for much that was to follow. 30 years later the legacy of the hunger strike and the sacrifice of the hunger strikers, and of three decades of successful political activism and growth, is evident in the political strength of Sinn Féin. Today, tomorrow and on Thursday, and after months of hard work on the campaign trail, republicans across the north’s constituencies will be putting in one final hard push to ensure that we consolidate our vote and build for the future. There will be some who will argue that voting is a waste of time or who will just not bother to vote. They are wrong. Voting is your opportunity to make a difference – to be part of bringing in real and better change. Elites have always sought to deny citizens the right to determine their own destiny. There was a time when most people didn’t have the vote. When monarchies and aristocracies decided how people lived and died. Sometimes the excuse was that someone was too poor; or too uneducated; or a woman; or of a different colour. But the goal was always the same. Restrict access to political power and influence so that a minority can benefit. The leaders of 1916 understood the importance of promoting and defending the rights of citizens. The Proclamation addresses itself to Irish men and Irish women and promotes universal suffrage at a time women didn’t have the vote. The Unionist regime following partition understood this. For that reason property qualifications were part of local electoral law and tens of thousands of citizens, mainly Catholic, were denied the right to a vote. Along with the gerrymandering of electoral boundaries this ensured unionist majorities on Councils in towns where nationalists were in the majority. That‘s why the demand for one person one vote was so threatening to unionism and why it was violently opposed by the state and its paramilitary forces. Denying the vote was part of the strategy of those, particularly in the deep south of the USA, who wanted to hold on to power and who rejected the civil rights demands of the 1960s. It was also central to the apartheid regime in South Africa. And in Arab states today citizens are dying in pursuit of the right to vote and to democratic structures of government. Voting is a human right it is also a responsibility. In recent years Sinn Féin has succeeded in bringing about fundamental change in the north. In local government and in the Assembly, in the Executive and through our MPs and MEP Sinn Féin has succeeded in delivering real improvements in peoples’ daily lives through the policies our activists implement and the decisions they take. Elections and electoral success have made a difference. In the recent Dáil and Seanad elections also Sinn Féin made important gains. But there is much more to be done. Not least in terms of achieving a United Ireland. And to do this and to continue to deliver for citizens Sinn Féin needs more votes to build even greater political strength. 95 years ago today the executions of the 1916 leaders commenced. The first to die were Padraig Pearse, Tom Clarke and Thomas MacDonagh. Their goal, like ours today was and is to build a new Ireland; a shared Ireland; an Ireland in which the rights of citizens are paramount. The 1916 Proclamation, they wrote and died for, is a powerful expression of the shape of that new Ireland. This Thursday every citizen with a vote can contribute to bringing that day a significant step closer by voting for Sinn Féin candidates for local Councils and for the Assembly. The Vital Economy is the Philosopher Stone. You created an effective, powerful team that can effect change and achieve its purpose, in this election. It is most true -What you risk reveals what you value. 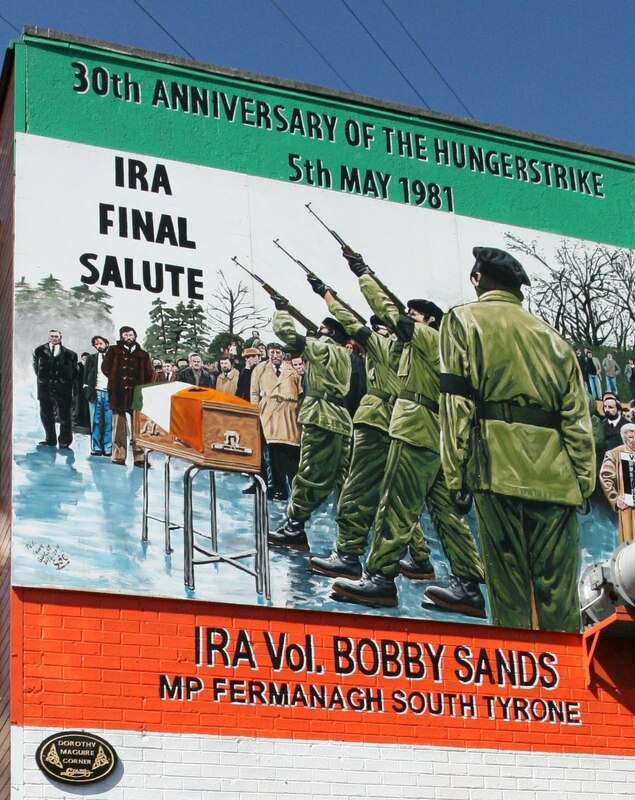 Bobby Sands was willing to risk everything for his values, for Republican values. When all is said and done, the only thing you'll have left is your character. The character of Ireland is about to change, and take that last step, for The leaders of 1916. To build for the future, the better life. Congratulations to SF on your electoral success!